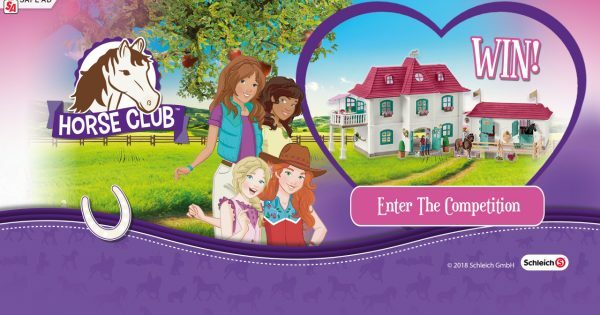 WIN Schleich Horse Club goodies! If your kids are mad about horses then you’re in luck as we’re giving one lucky reader the chance to win Schleich Horse Club goodies! Whether your kids want to pet or gallop around the riding school with their horse and rider, these Schleich Horse Club goodies are fantastic for imaginative play. Each of the horses comes with their own rider who is dressed in a matching ensemble. The riders are fully articulated, free standing and able to sit on the horse with their feet in the stirrups which allows the kids to act out loads of different situations and make a Horse Club adventure of their very own. Sarah’s Baby Animal Care comes complete with everything that you need to take care of your very own horse mare, foal and puppy! Each figure is made from strong plastic and is beautifully hand-painted. To enter, simply answer the question and fill in the form to the left before the closing time of Sunday 14th October. Good luck!